Written by Yuichirou Koizumi and drawn by Sasako Mitomo, Danganronpa Gaiden: Killer Killer is a Spin-Off work within the Danganronpa universe, specifically tying into Danganronpa 3. 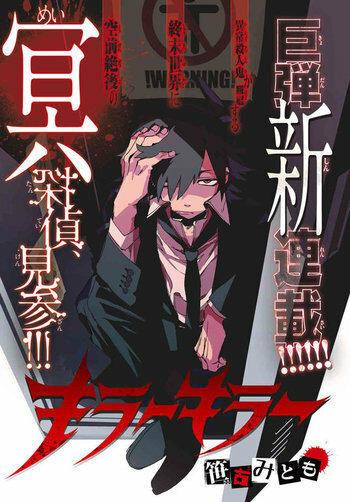 When it was initially launched in March 2016, the manga was advertised and presented as a separate work, but was eventually revealed in the third chapter as being in the same universe and subsequently rebranded. Absurdly Sharp Blade: The sword Hijirihara uses in Chapter 7. It can cut off the roof of an entire hot springs resort and decapitate just one person with a delayed swing. After the End: Comes with being set after Danganronpa. It seems to have recovered pretty well, seeing as the idol industry, hospitals and the manga industry are all back up and running. Artistic License  Biology: Hijirihara somehow cuts off and then reattaches Asano's head to remove the explosive collar Fujigawa places around her neck. Somehow, she survives this. This is not possible for a number of reasons, but mostly because the nerve cells in the spinal column would be severed, and the brain would be unable to function even if the head was reattatched. Autopsy Snack Time: Hijirihara takes time during the first investigation to scarf down instant ramen. He also has no problem announcing he's thirsty after hugging a corpse. Better to Die than Be Killed: Fujigawa detonates a bomb to kill himself rather than let Hijirihara finish him off. Bloodier and Gorier: To say the very least. The first chapter alone shows the culprit's head being cut up and basically exploding courtesy of Hijirihara. Mekuru Katsuragi is said to be able to determine any culprit after taking in all the data and then sleeping on it. Call-Forward: Several characters from Danganronpa 3 appear, including Munakata and Tengan. One chapter shows how desperate Tengan's vision of hope is, and the final chapter has Tengan visiting Mitarai, and Yukizome watching Munakata with her swirly despair eyes. Chalk Outline: Kirigiri can be seen examining one with some other Future Foundation agents in chapter 3. Conservation of Ninjutsu: You'd expect a clone army of Mukuro Ikusaba to be nigh unstoppable, only for Hijirihara to cut through them like they're nothing. Justified since they aren't actually Mukuro clones, just wannabe murderers that are trying to act like Mukuro. Couldn't Find a Pen: Saiyama didn't need to stab that corpse over and over to write with its blood. He just decided to while breaking down in front of Hijirihara. Criminal Mind Games: In the very first chapter the culprit sends a warning in the form of a 4koma. In the end, Hijirihara himself leaves a message for SCI to find. Dies Wide Open: These type of eyes being the first we see of Naegi implies as much...or, rather that it isn't the real him. Dude, Where's My Respect? : Saiyama's motivation for killing was mainly to collect praise for his work, going so far is to kill for a realistic reference. Hijirihara praising his realism is enough to move him to tears. Happens yet again in Chapter 5 with Tsuruhashi, who murders the Secretery of Defence just so her can frame his superior for an international incident, all because he never respect for what he's done. Everyone Went to School Together: Hijirihara and Fujigawa went to middle school together. That's when they witnessed the Giboura Massacre. Expendable Clone: The true nature of Mukuro Ikusaba's postmortem appearance, evident once Hijirihara starts killing her over and over again. First-Episode Spoiler: The incident in middle school left Hijirihara more than a little...unhinged. Five-Second Foreshadowing: In Chapter 3 and 4, what might notice that Chikatilo changes hairstyles slightly between scenes and that he demonstrates signifigant punching strength. That's because it isn't Chikatilo, but Juuzou Sakakura in disguise. Foreshadowing: It's mentioned in the first chapter that cults have become more common after "that incident". That incident happens to be the Tragedy. The title's font bears a resemblance to Danganronpa's signature title. In Chapter 3, Saiyama is killed in a similar manner to Mukuro Ikusaba. Chapter 8 reveals that she was indirectly responsible for making Hijirihara obsessed with serial killings. Chapter 10 reveals that this also happened to Fujigawa, for completely different reasons. In Chapter 8, a flashback shows Fujigawa accidentally stepping on Hijirihara's face. The flashback in Chapter 10 shows a panicked Fujigawa stomping the class representative's face after the Giboura Massacre. Ghostly Gape: Fujigawa sees this on the dying class representative, causing him to freak out and stomp his face into a pulp. Glowing Eyes of Doom: Before killing Saiyamna, Hijirihara's left eye can be seen glowing with Monokuma's jagged red eye. Go Out with a Smile: Fujigawa smiles at Hijirihara just before he commits suicide via bomb. Grenade Tag: Chapter 3 starts with Ted Chikatilo seemingly having killed multiple Future Foundation agents and finishing by ramming a bomb down his last victim's throat and tossing them into the air like a live firecracker. Irony: For all of Hijirihara's obsessions with killing with passion: The very person who inspired him is not passionate in murder in the slightest and ironically shares a number of similarities with the serial killers he dismisses. First, Mukuro only committed the massacre in his middle school to prove herself to Junko, reflecting Itou's means of using murder as a means to an end. Mukuro is often described for having no feeling for the world and doesn't seem to care about who she kills, something he also points out. Mukuro also killed solely for her sister's sake without any true personal investment in her killings, which Hijirihara condemns with her fakes. Finally: other materials like IF and Zero show that Mukuro has had a few reservations about her part in Junko's plans, showing a complete and utter lack of conviction that he himself praises so much. I'm a Humanitarian: Itou thinks drinking human blood is the secret to eternal youth. Hijirihara criticizes his lack of passion for murder by turning it into a means to an end. Improbable Aiming Skills: Hijirihara pulls this off in the final chapter by tossing a dagger at Asano's neck, decapitating her long enough to disable the bomb collar. And she survives this. Jack the Ripoff: Saiyama re-created the entire killing game by imitating the murders that took place in it with real people as the reference. Hijirihara accordingly impales him with several oversized ink pens in the same fashion Mukuro Ikusaba died. Karmic Death: Hijirihara is generally fond of killing the various culprits in ways reminiscent of their own murder methods, as though to cap off his assessments of them. Knife Nut: Hijirihara's skill with his knife and willingness to utterly destroy his victims with it implies this much. Late-Arrival Spoiler: If someone were to read Killer Killer before watching Danganronpa 3 (which was finished months before the last few chapters were published), then they'd probably figure out too soon that Tengan and Yukizome are not to be trusted. Losing Your Head: In the final chapter, Asano is decapitated by Hijirihara to disable the bomb collar. She survives this, as her head is somehow immediately reattached the instant it falls back on her neck. Love at First Sight: Hijirihara to Rei Shimizu. He also fell for Mukuro Ikusaba while watching her kill a group of middle schoolers. Nightmare Face: The culprits are prone to doing this after being caught. Nightmare Fetishist: Hijirihara's fondness for serial killers borders on this. All the doctors in the second chapter proudly announce their respective organ fetishes. Not to mention the culprit's obsession with parasites. Not So Stoic: Witnessing the Giboura Massacre completely breaks Fujigawa's calm demeanor, to the point that he turns into a Knight Templar to stop all serial killings. Off with His Head! : Happens to Tomizawa and Asano. The latter survives. Old Cop, Young Cop: The main pair's dynamic, though they aren't that far apart in age. Peek-a-Bangs: Hijirihara's lazily-kept hairstyle turns into this. The Points Mean Nothing: Hijirihara has a habit of grading culprits technique in murder. Prim and Proper Bun: Dougami's way of looking sterner/more authoritative. Some call her "hairpin demon" because of it. Rain of Blood: Ted Chikatilo lays down to enjoy the one he creates after the bomb he sets off (mentioned above) explodes like "beautiful fireworks" (as he calls it). Red Herring: All the doctors being organ fetishists in a hospital where the victim's organs were harvested was set to throw readers from the real culprit's purpose with the organs. Retcon: While it had been suggested before, the manga completely retcons out the more apocalyptic portrayal of the Tragedy given Danganronpa. While the world was indeed in a very bad state, nothing implies that the forces of SHSL Despair had the grip the first game said they did and in less than a year things have rebuilt a fair bit. Although, given our only source for the state of the world in the first game was none other than Junko Enoshima, who was almost certainly trying to play the Tragedy up to make her remaining captives despair, this state of rebuild is actually plausible. Right for the Wrong Reasons: Asano sees Hijirihara show his first emotions and thinks that the murder angered him. Turns out he was just disgusted by its intent. Serial-Killer Killer: Hijirihara's shtick in a nutshell. Fujigawa too, since he originally held the title of Killer Killer. Shout-Out: Hijirihara makes Asano recite several stock phrases from Kindaichi Case Files to unnerve the first culprit. Turns out his grandfather was a fan. Slasher Smile: With the left side of his Face Framed in Shadow, Hijirihara's smile widens the same length as Monokuma's after killing Saiyama. Signature Laugh: Hijirihara can be heard chortling away with Monokuma's "Upupu..." after killing Saiyama. Stealth Pun: Tsuruhashi's methods and motive are connected by one. The word 首 means both "neck" and "fire" and Tsuruhashi was trying to get Sakakura fired by using neckhanging. Also, 吊る, which means "to hang", is pronounced "tsuru" (although it is not the same kanji on Tsuruhashi's name). Stress Vomit: Fujigawa does this whenever he gets too emotional. It started after witnessing the Giboura Massacre and killing the class representative. Symbolic Mutilation: The victims in the first case have their body-parts stuffed together to create multi-armed statues of Asura. Chapter 7's victim is posed to resemble an old form of public execution, where the victim's body was used as a pedestal for their severed head. Together in Death: Heavily implied with Asano and Hijirihara in the end. Unperson: What happens to Shimizu. Wham Episode: Chapter 3, when the manga reveals itself to be a Danganronpa Spin-Off. Chapter 8: Asano learns that Hijirihara is Killer Killer, the perpetrator of the Giboura Massacre is revealed to be Mukuro Ikusaba and the Eight Branch is attacked by someone who seems to be the deceased Ikusaba. Chapter 9. Oh boy, chapter 9. There isn't just one Mukuro attacking the eight branch, there's an entire army of them! Oh, and Asano is stabbed by Fujigawa, who is crying his eyes out while doing it. Chapter 11: Fujigawa reveals himself as the Killer Killer in a livestream, and claims he has set bombs all over the country, set to go off in 24 hours. The only way to stop them is to kill Asano, who has the disarming device in a necklace she's forced to wear. She can't remove it herself, or else it will detonate without disarming the bombs. Wham Line: Chapter 8 ends with Dougami calling Hijirihara and saying "Mukuro Ikusaba broke out!" When Hijirihara kills Saiyama, the background shifts to depict Monokuma, confirming this is indeed a part of the franchise. Subverted with the ending. Asano sees what seems to be Makoto Naegi's corpse, only for the following chapter to out it as firework. In chapter 4, Chikatilo walking into the stadium midway through the fight between his doppelganger and Hijirihara. This is followed by outing the imposter as Juuzou Sakakura. Chapter 8 has the lovely image of Mukuro Ikusaba cutting her way through a middle school. Chapter 9 has a pretty big one. Fujigawa stabs Asano through the stomach. Chapter 10 features one with the appearances of Sonosuke Izayoi and Ruruka Andou. Chapter 12 has an appearance from Kazuo Tengan, who plants a tracking device/detonator on Asano. You Are Already Dead: Itou thinks he's fine before his flesh explodes off into several square strips of skin. Tomizawa thinks Hijirihara missed his sword swing at her. A few seconds later, her head (and the entire roof of the hot springs resort) comes right off.